I just went to Mr and Ms Cafe today with my babe Jayth which located in Ara Damansara, Oasis square, feel so excited when we were heading there, coz I always wanted to go there and finally!! Here we are!! The buildings there are very unique and pretty which surprised me very much, I like the environment and not hard to find parking! this is better than Bangsar area hahahaha. Back to the topic, the environment of the cafe is very comfy and relax. The decoration is very simple, unique and comfort too. And I found out that the price is out of my expectation, I thought their foods might be very expensive but actually is quite reasonable for me. My babe and I had ordered one smoked salmon with scramble egg, pancake, hot mocha and hot chocolate ( my babe wasn't hungry that time so we just ordered few). This pancake looks like very small portion, but this pancake make me super FULL, although I just had few bites. Cute art on hot chocolate and hot mocha. However, maybe is a curse? ( sweet curse??) my boy super love burger T-T how come??!! Because of him, I really had most of the burgers in my lifetime. Fat boy, burger hug, even in Kimgary ( can u imagine that? kimgary?) and my most fave Burger Lab. I went Burger lab once and just now I went there again! !just because I saw they updated their instragram about they are launching new flavor burger and the photo is really tempted me. The upper one is Sloppy Bella and bottom one is Popeye the Sailorman. The price for two sets is rm 43. If not mistaken ala carte should be rm 15-16 each. Quite affordable and reasonable for me but next time I won't order set anymore coz I don't wan to waste the fries. Today I gonna blog about the 3CE lip lacquer, I bought 3 colors in total. My friend said the 3ce shop in Korea is full of foreigner especially Malaysian. Hahaha, mayb is the blogger effect? Janechuck, bobo them are all using it. Honestly the 1st time I know about 3ce is from a blogger which is bobo and I really love the colours. So, I'm gonna give it a try to ask my girl bought it from Korea. The three colours that I bought for myself are Backstage, Super Carol and Bon Bon. Their price is about RM 60.00 each. Here is the close up pic. I applied Super carol and Backstage on last week and I super satisfy with the colour. 非常的显色, 而且颜色会变成雾色当我用手指晕开. ( Sry for my poor english) Plus I can get different effects when I apply it with different layers. But have to beware of one thing is personally think its quite dry on my lips after I applied it with longer time. And i really don like the 'dry' lips feeling, So what I would do is I will apply lip balm before I apply the lip lacquer like before 1-2 hours to make sure my lip won't get dry or crack. It will be a disaster if ur lip crack with lip lacquer cz it will show up obviously. Overall I really satisfy with it so I think I will use it before I can get a better one. Hehe. Here are my lips photo after I applied 1)Super Coral and 2)Backstage. The colours not very obvious cz I took the photo under yellow light and also I just applied one layer. I am a sushi fever, I really love sushi very much, ummm can say is that I love foods very much, is not only sushi. But sushi is my all time fave since I was in high school. I think the main reason that I love it so much might be I love seafoods and rice. Haha... Urrgg hmmm .. Yea I admitted that I love to eat rice, at least one of my meal per day. And one sushi meal can satisfy me with my needs and desire of everyday. When I was in college sushi zanmei is my 1st choice when my girls asked me to think where we are going to have our lunch. I'm glad that my girls love sushi too so we never feel bored about it Hahahaha. And mayb Taylor's university is just so nearby Sunway Pyramid and they have plenty of sushi restaurants such as saeke sushi, Zen sushi, zanmei sushi, and sushi king as well but I still love Zanmei the most. Sry for didnt have any 'special' sushi set photo coz my hands and mouth always faster than the mind I remember that i have to take photo especially when i saw really pretty, special and delicious sushi set. So ....... my fault. My boys always said me that I always craving for sushi ( he is not sushi fan before, not even now also) but he still will bring me to go cause he knows that I love it. You are the best for me. 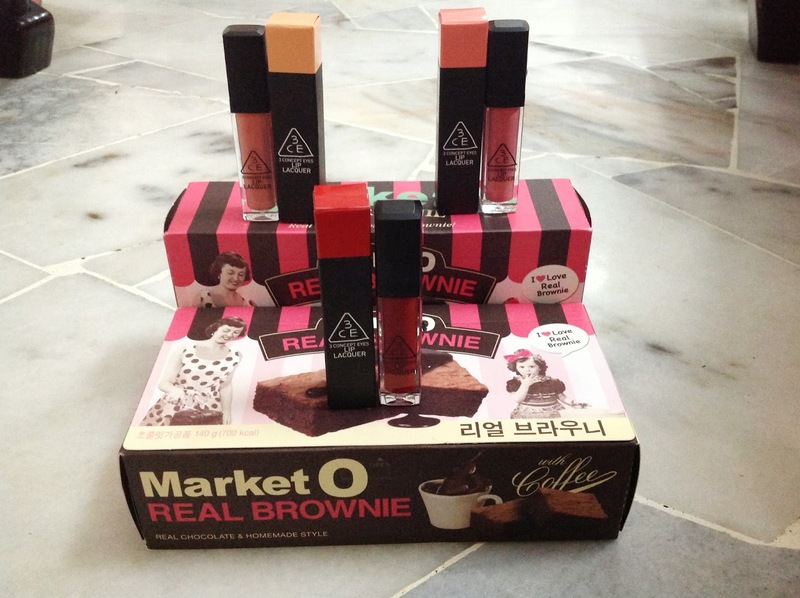 Today rushed to mid valley with my boy with excited feeling, Yeeni just back from Korea along with my 3ce products and my fave brownies!!!!! Even it had to sacrifice the time watching LCW vs Lin Dan's match tonight. Feel sorry to my boy coz he force to skip the match but I just really can't wait to get it. ( I'm inpatient, I know) anyway will watch the match with him from Internet. I totally bought 3 lip lacquers , which are backstage, super coral and Bon Bon. I'm very satisfy with the colors, although haven't really apply on my lips yet. Hehe will try it on tml. And I chat with Yeeni a lot too, work issues, friends, family etc. kinda stress recently, always insomnia. But I'm big big girl now just learn how to deal with it. Cheer :-) don't wanna talk bout it in the middle of night, or else I couldn't sleep well tonight. How long have we been together? Almost 10 months. In this 10 months, I have tasted sour, bitter, joy, happiness ....finally I can know the feeling to have a bf. and this has made me changed a lot too, to become a person , a girl that I never know myself. I was a independent, strong, confident girl until I met him. He always take care of me, bring to wherever I want to go, buy me my fave foods, shopping together with me, help me settle all my things. At last, I became who am I now. A lazy and fat girl. Most important is I started feel like I can't live without him. Unbelievable, just 10 months and hell I changed this much. There are problem comes in when the relationship goes longer. Today I start questioning myself, am I too reliable on him? So that he's starting to inpatient on me, rather stay at home than come to see me? Or am I too over reacted? Greedy? Am I losing myself? Time flies, I couldn't believe two of my besties are almost left Malaysia around 1 year, really missing them much. I really hope that I can meet them ASAP to share what happened between us around this 1 year, what they experienced in Korea and England ( ummm...can say consider whole Europe)😛. Is this my fate? Most of my buddies already move out of Malaysia . I really feel lost and panic when I knew it at the moment😭but god isn't that bad right, I met him.😳 I feel that I'm the luckiest one to have him. Hmm..hmm.. But nvm !!!! Two of them 8 po are coming back!!! Wakakak and I received the post card from my dear lok2!! She went to santorini, I wish I can be there too 😱, it's my dream place to travel!! !